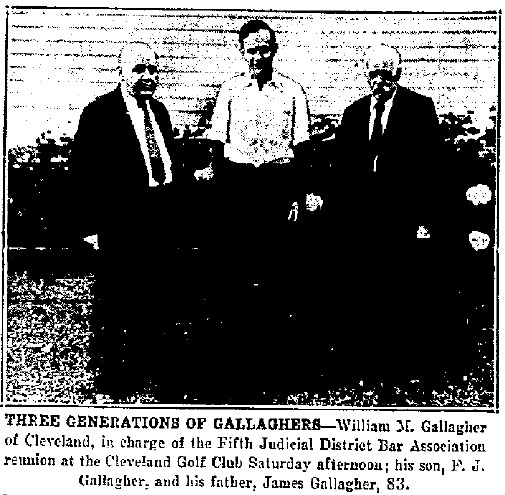 "Mr. Gallagher was considered one of the leading authorities on county and town law, in the State of New York. His counsel was sought in these matters by State officials and legislators, as well as by local officials. He was a leading figure in the Association of County Officers of New York State, and served on the most important committees of that body, including legislative and welfare. In this service he had much to do with legislation for revision of county and town law, also in amendments to the welfare law designed to lower the public welfare burden. William M. Gallagher, 65 active as a lawyer, and in Oswego county public service for 40 years, and retired county attorney died unexpectedly Tuesday, Christmas Day about 1 P. M. in Oswego hospital. He passed away before Mrs. Gallagher could reach the hospital from their apartment, 165 West Third street. [S112] 1920-1922 Cleveland Registry Delivery Book, Albert B. Cadd and William Fitzpatrick, (Unpublished), 3-4 (Reliability: 2), 16 Oct 1920. [S11] Cleveland Lakeside Press, 1 (Reliability: 1), 27 Aug 1930. [S84] Personal Correspondence, 1 (Reliability: 1), 6 Apr 1942. [S19] Find A Grave, findagrave.com., http://www.findagrave.com/cgi-bin/fg.cgi?page=gr&GRid=36745760 (Reliability: 1), 5 May 2009.